Too hot to walk in the sunshine? No problem. 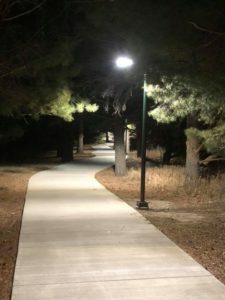 The City of Colby is installing lighting on a popular fitness trail, inviting more use and providing better security. Half of the 52 total lights are in place and the project should be completed this fall. The city reports an increase in use of the trail in the twilight hours and positive feedback from community members. The project was supported by a grant from the Hansen Foundation.